The Handling Systems International Model 314 mast type jib crane is floor mounted, with upper support from a building truss or bracket. 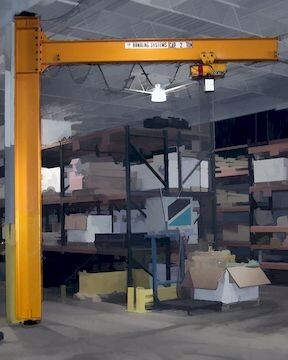 This jib crane provides 360° of rotation and does not need a foundation. This reduces the cost of installation. This is a low headroom jib crane design and is also available with drop boom. Both the full cantilever and tie rod style jibs are also offered in a mast type format. Call 800-509-6131 for custom optional configurations. 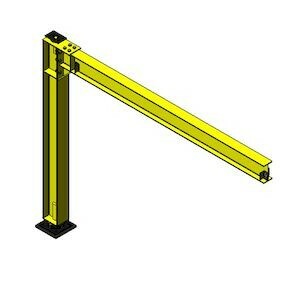 The Model 314 features a wide flange mast and steel I beam or wide flange boom. The I beam is sized for minimal deflection, with a rigid connection to the mast via heavy plates and bolts. Top fitting assemblies use flange type bearings. Bottom fitting assemblies use tapered roller bearings (cup and cone) with grease fittings. All structural steel is painted with one coat of safety yellow enamel. Fittings are painted black. Call for custom paint options.